The News - Accurate, Fair and Balanced ... Everytime! Basseterre, St Kitts, April 6, 2019 – A female security officer who insisted on carrying out international and mandatory safety protocols when a St Kitts and Nevis government minister, Hon Ian Patches Liburd allegedly breached security at the Robert L. Bradshaw International Airport on March 30, 2019, is being victimized. According to multiple sources, the female officer, who has not been named, has been informed that she will be transferred from the airport to the sea port from April 8, 2019. Earlier this week, Terry Adams, former assistant comptroller of customs with responsibility for operations and enforcement and ex-member of the Board of Directors at the St Christopher Air and Sea Ports Authority (SCASPA) expressed concern that the security officer will be victimized for performing her duties professionally and complying with international procedures to ensure the safety of passengers, aircraft and other stakeholders. According to passengers the minister entered the sterile area with a senior airport security official. In keeping with international rules and regulations airport security officers informed the minister that security procedures will have to be carried out. The minister allegedly protested, refused, launched a verbal attack on the security officers, walked out to the airport ramp and gave a departing passenger a package. Former national security minister, Dwyer Astaphan pointed out that if the allegations are true, “it is not only a problem for St Kitts and Nevis, but also for the United States which would have a very serious interest. “If anyone is going to compromise the security protocols and disrespect the security officers you are potentially hurting the economy of the country and hurting the opportunities for our people to be gainfully employed in our country,” said Astaphan, who also held the tourism portfolio. “That has some severe implications for the country, for the economy,” said Astaphan. The Bradshaw airport is served by international flights from American Airlines, US Airways, United Airlines, Delta Airlines and Sun Country from the United States; Seaborne and Air Sunshine from the United States Virgin Islands; Air Canada from Toronto; British Airways from Gatwick-London; WINAIR from St Maarten and LIAT, the regional airline. 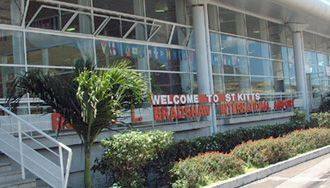 St Kitts tourism ministry issues advisory to travelers.